WARNING! Don’t get ripped off by the cowboys! In the last month, four Cambridge residents have contacted me for advice about a cowboy tree company. The first victim told me a very familiar story I have heard many times before. I will call him Mr Brown for anonymity. One day there was a knock on his door. A man was there who claimed to be an arborist (tree surgeon) and offered to prune his trees for a very high price. After some bargaining, Mr Brown managed to get him down to less than half his original quote. Thinking this must be a good deal, Mr Brown gave him the job. The man said they were working nearby that morning and would be able to do the tree pruning the same day. Less than 5 minutes later a truck arrives with more men in it and they begin to prune (hack!) the trees. Before the job was finished the man asked for payment, claiming that their truck was full of branches and they needed to pay for dumping them. Mr Brown didn’t want to upset them and gave them a cheque. The men then drove away leaving the job unfinished, never to be seen again! When Mr Brown realised they were not coming back, he rang the bank to stop the cheque, but it was too late! It had already been cashed. These unprofessional cowboys didn’t leave any contact details so Mr Brown had no way of following up with them. The second victim I will call Mrs Green. She had a magnificent garden with many well shaped and attractive trees. She also had a knock on the door, and found a man there offering his tree trimming services. He claimed that he was an arborist and her trees needed pruning. Mrs Green had just been thinking about getting some tree pruning done, so she eagerly accepted his offer. A few minutes later a truck arrived with more ‘arborists’ and they set to work. Unfortunately this time they finished the job! This was unfortunate because they hacked and butchered her trees. These men were not the tree experts they claimed to be, and they ruined every tree they touched. Keeping a little good humour she smiled and said “I won’t tell you what my husband said when he got home and saw the trees!” Sadly for her it was too late. The damage was done. It will take many many years to restore her trees to something like what they were before, if that is even possible. The most alarming to me personally was two separate Cambridge residents, who had these cowboys knock on their doors also. Both residents told them their services were not needed because they used Groundzone tree care for their tree work. 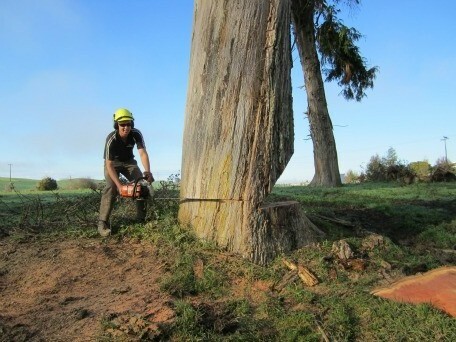 In one incident the cowboy claimed to be doing all of Groundzone tree care’s work for them! In the other incident he tried to claim that he himself was Nathan from Groundzone tree care! Professional arborists/tree surgeons do not behave like this! These are the cowboys of our industry. 1 – They will drop in without you asking them to. 2 – They will claim your trees need pruning. 3 – They usually want to start work immediately or the same day. 4 – Often they ask for payment before the work is finished! 5 – They will hack your trees and ruin them. Solution: Don’t engage anyone who just turns up at your door. Find a local tree company and call them. Solution: Ask them to identify different trees in your garden. Also, ask them why each of your trees need pruning. It will soon be obvious that they don’t know anything about trees. Solution: Don’t let anyone pressure you into letting them start work immediately. Ask for a written quote and a business card, and take time to think about it. Solution: Don’t pay a cent to anyone until the work is completed to your satisfaction. A PROFESSIONAL WILL NEVER ASK FOR ANY PAYMENT UNTIL THE WHOLE JOB IS FINISHED. Solution: Be absolutely sure you have engaged a qualified arborist (tree surgeon) who knows trees and how to prune them. Ask for evidence of qualifications if you are not convinced. Have you had an encounter with some cowboy tree workers? Let us know about your experience. We would love to hear from you. We provide free quotes and free site visits throughout Hamilton and the Waikato region including Cambridge, Te Awamutu, Otorohanga, Matamata, Pirongia, Tirau and Morrinsville.